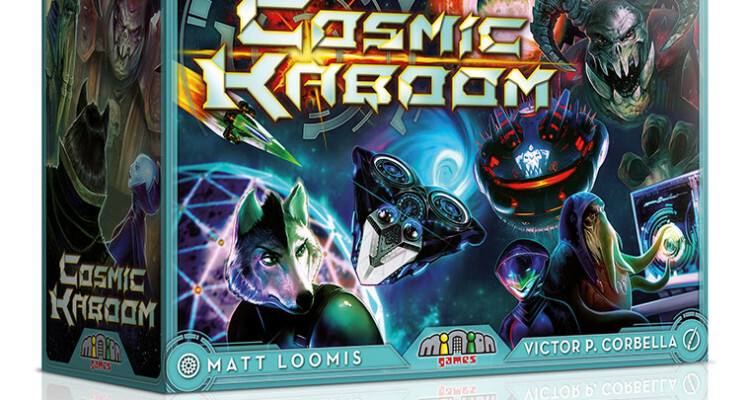 Cosmic Kaboom, from designer Matt Loomis and Minion Games, is an enjoyable fast paced dexterity game where you and your friends compete in a war for the galaxy! In Cosmic Kaboom, you and your friends will be flicking your ships around the board, collecting energy crystals, fueling space bombs and annihilating planets. To differentiate the races, you receive one advancement card at the start of the game. 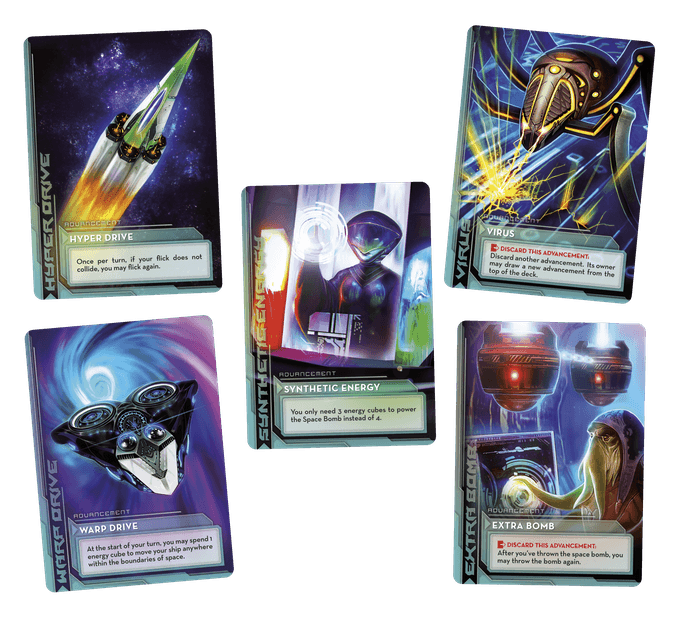 These advancement cards provide a variable power or bonus that allows you to alter the standard rules; things like taking an extra turn or needing fewer materials to build the giant space bomb. There are twelve planets in the Cosmic Kaboom galaxy – three each in four different colors. Each player controls a set of these colored planets numbered one through three. 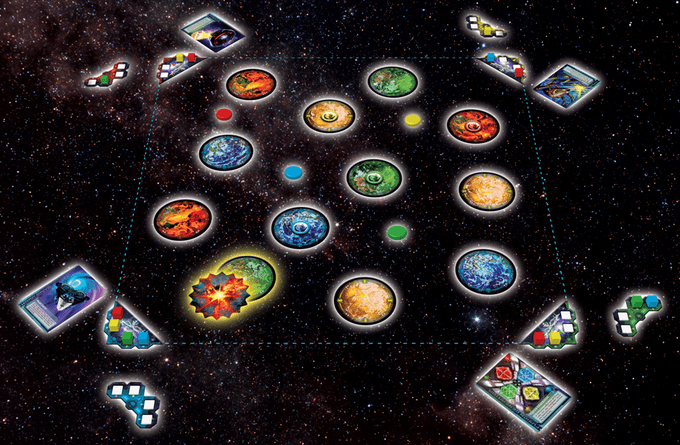 At the start of the game, each planet marked “one” houses an energy crystal in the corresponding color. When you flick your ship into a planet with an energy crystal, you receive an energy cube of that color. Once you’ve collected an energy cube, the energy crystal moves to the next planet in sequential order (i.e. one moves to two). As a reward for your piloting skill, you may continue moving until you miss or collect all four crystals. Once your ship is loaded up with an energy cube of each color, you will deliver them to your base and construct a SPACE BOMB (dun dun dun!) that you throw onto the board (literally). Once thrown, you collect any planet that the space bomb lands on, granting you points at the end of the game. As a minor consolation, the opponent whose planet was just obliterated gets an additional advancement card. The game continues until one complete set of planets, or a majority (seven) of the planets, is destroyed. Whoever has amassed the largest collection of points is then declared ruler of the galaxy! Like Terror in Meeple City and others in the genre, Cosmic Kaboom takes simple set collection and adds in a few satisfyingly fun dexterity driven mechanics to this core. 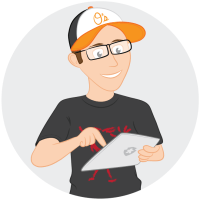 As far as dexterity games go, the key is to keep players engaged both physically and socially. Cosmic Kaboom does this with fast paced turns and just the slightest bit of take-that, highlighting all that is fun in the dexterity realm. There is no greater pleasure than chaining your shots together to collect multiple crystals in one voyage and following that up with a destructive toss of the space bomb. Cosmic Kaboom is versatile and portable, allowing you to create a modular playing surface as large or small as you like based on the desired location or play time. Also, the artwork from Victor Corbella is vibrant and flavorful, immersing you in the galaxy created on your table. The advancement card powers offer a unique experience without feeling completely out of balance or over powered. As your planets are destroyed, they also act as a catch up mechanic, granting more powers to help you get your race back in the game. Your fingers will warm up at some point, right? 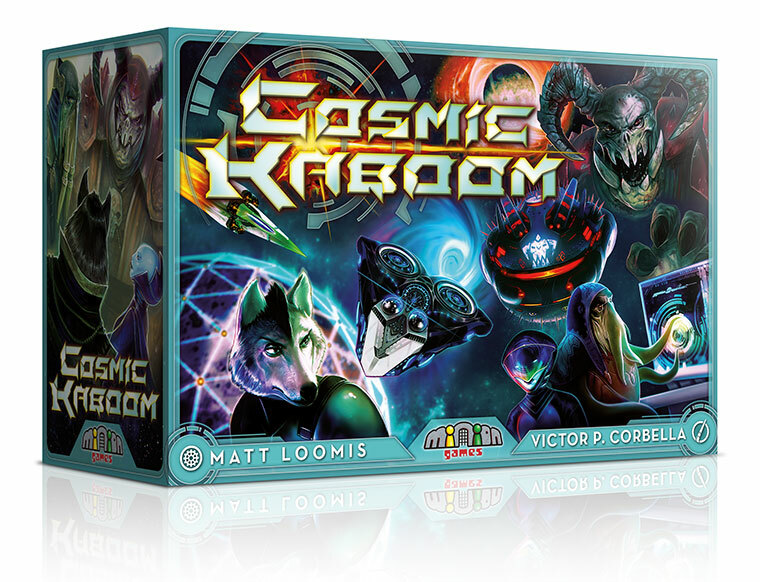 Cosmic Kaboom seamlessly blends many familiar mechanisms together to create a clever, entertaining space romp that the whole family can enjoy. I would highly recommend this for fans of dexterity games and those who appreciate fun games in general! I love dexterity games as well as games set in space so it’s not hard to see why I was attracted to a space themed flicking game. I first played this title at Unpub 5 and quickly fell in love with the variable player powers and the immensely gratifying ability to chain multiple flicks together in quick succession. With the beautiful art of Mr. Corbella, all of this comes together for an entertaining and memorable experience. 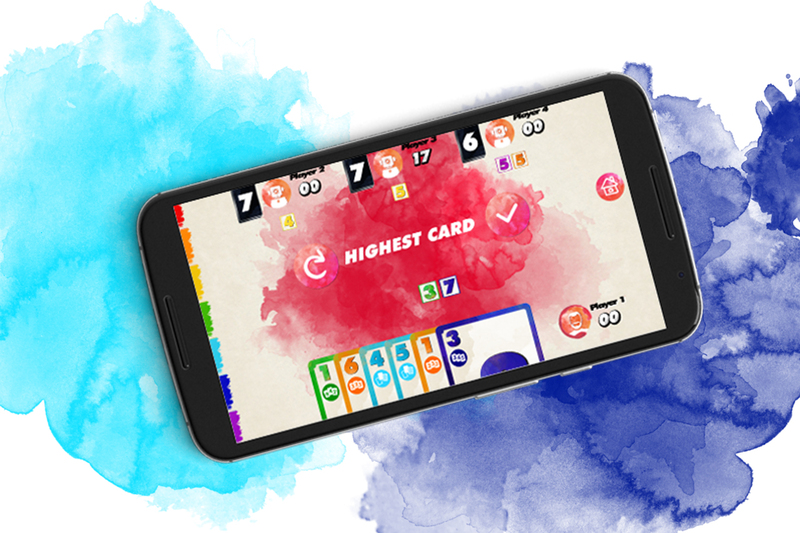 If you are a fan of dexterity games, you’re going to really enjoy Cosmic Kaboom. If I had a dollar for every time that I went to make a very calculated flick and ended up whiffing, I would have enough money for a couple of steaks, but that does not dampen my love of dexterity games at all. I was able to play Cosmic Kaboom and loved every second of it. Flicking your ship around the table in an attempt to hit the different planets is so satisfying, even if you do flick too hard, fly off the edge of the board, and lose all of your crystals. 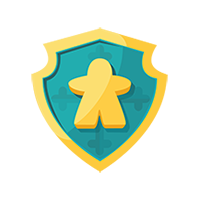 The addition of the advancement cards really mixes things up and keeps the game fresh. All of this combined with the quick setup and easily understood rules makes Cosmic Kaboom enjoyable for any type of gamer and will likely leave you wanting to play “just one more time.” I look forward to backing this one and playing it over and over again. 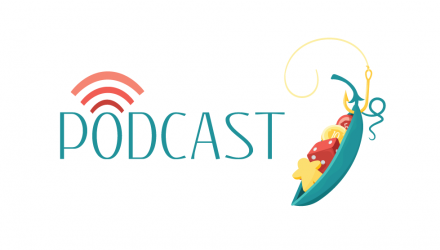 Cosmic Kaboom does a great job at recognizing its place in the hobby and embracing that identity. The game is fairly bare-bones, but in the dexterity genre, more so than any other, this is completely acceptable. Players bringing this to the table want to engage with those dexterity elements without fluff getting in the way. Cosmic Kaboom allows for just that, making your success or failure a matter of your own abilities. While this may sound like I’m reading too much into it, I really appreciate the simplicity of the game and how that quality breeds a real sense of satisfaction when you play well. It also makes (Steve’s) crushing defeat that much more hilarious. Simply put – if you dig flicking little discs across a table, go back this project. The League of Nonsensical Gamers would like to thank Matt Loomis for kindly providing us with a prototype of Cosmic Kaboom for this preview. 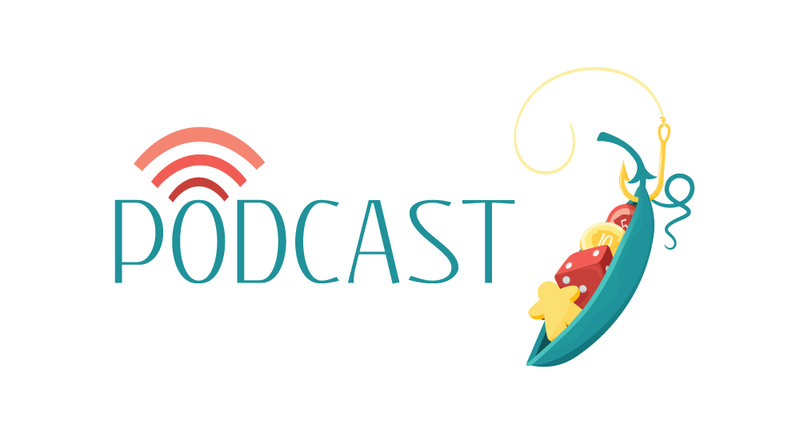 Cosmic Kaboom is currently funding over on Kickstarter. If this game piques your interests, wander on over to the campaign page by July 2, 2015 to purchase your own copy. For $25, you will receive a copy of the game along with all of the stretch goals that have been attained.